“Unreasonable”: CCTV’s 10pm Evening News (晚间新闻) bulletin introduces the US FONOP near Mischief Reef, Thursday May 25, 2017. Chinese media coverage of the recent US naval patrol near its outposts in the disputed Spratly Islands suggests, to me at least, Beijing’s increasing confidence in its handling of public opinion on this sensitive issue. In turn, the content of some of Beijing’s publicity offers insight into China’s intentions for the handling of the matter going forward. Specifically, the government’s response suggests a firm determination to avoid escalating tensions. It could even foreshadow an increasingly tolerant attitude towards US assertions of freedom of navigation into the future. The basis for this speculation is outlined below, but as always i’d encourage readers with other explanations to get in touch or leave a comment. Students of PRC foreign policy constantly come up against the question of whether the actions of the Chinese state are the result of decisions made by the centralised leadership or individual state agencies. Linda Jakobson and Dean Knox’s 2010 SIPRI report, ‘New Foreign Policy Actors in China‘ provided an excellent overview of the range of players on the Chinese foreign policy scene. Taking a similar approach in relation to the South China Sea issue, the International Crisis Group’s ‘Stirring up the Sea (I)‘ report earlier this year emphasised the incoherence that can result from individual (and sometimes competing) agencies acting according to their own priorities rather than a consistent centralized policy. 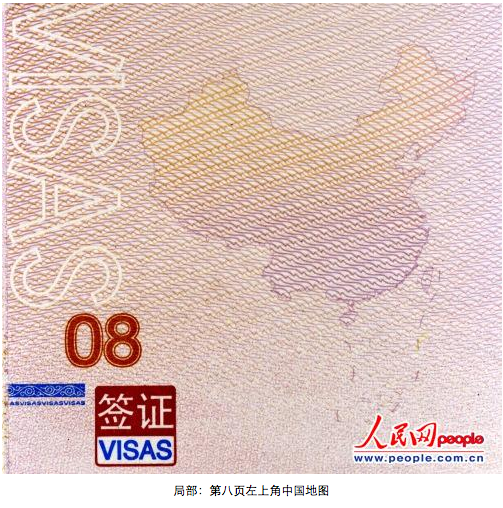 In the PRC’s latest diplomatic disaster, images embedded on the visa pages of the PRC’s new passports have managed to simultaneously provoke the official ire of Vietnam, the Philippines, India and Taiwan. The two South China Sea claimants have protested the inclusion of a map including the nine-dash line representing China’s “territory” in the disputed sea, India disputes the maps’ depiction of Arunachal Pradesh as part of Tibet, and the passports’ pictures of Taiwan landmarks prompted rare expressions of anger from Ma Ying-jeou and the ROC’s Mainland Affairs Council. 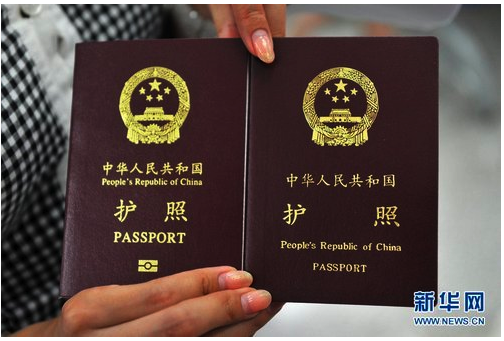 China’s ministry of public security oversees the design and issuing of the new Chinese passports, according to an official at the Chinese foreign ministry who declined to comment further. The next day the Guardian quoted MFA spokeswoman Hua Chunying saying, “The outline map of China on the passport is not directed against any particular country.” Yet neither the Chinese nor the English versions of the official transcript of Hua’s November 23 press conference include the comment, suggesting that the Foreign Ministry remained disinclined to take responsibility for the move. The SIPRI and ICG reports mentioned above didn’t focus much attention on the Ministry of Public Security as a player in PRC foreign policy, but it has certainly become one, inadvertently or otherwise. Two weeks ago, with the state–inspired media wave receding, a timely fishing ban arriving to diffuse tensions, and China’s economic leverage and superior law-enforcement capabilities combining to put it on top in the dispute over Scarborough Shoal, the Foreign Ministry had a message for the world: the PRC authorities will continue to ignore public opinion on the South China Sea. Only problem was, the way the message was delivered probably made it clearer, and definitely louder, for domestic audiences than foreign. Journalist: Some netizens have advocated the use of military means to resolve the Huangyan Island issue. What is your response to this? 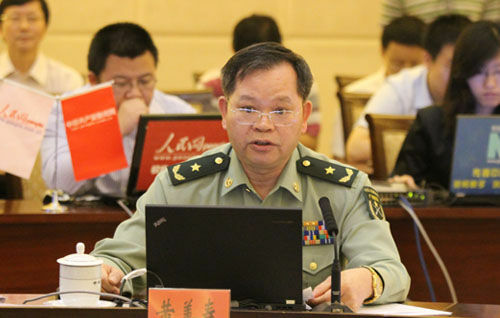 Hong Lei: The Chinese government’s determination to uphold territorial sovereignty over Huangyan Island is firm. At the same time, we are working to resolve the current situation over Huangyan Island via diplomatic consultation. Hong didn’t actually address the issue of the “netizens'” advocacy of war at all — his answer just restated the official Chinese position that the PRC is committed to resolving the crisis through diplomacy. In fact, so little did Hong Lei say, and so widespread the reporting of it, it might even be (over-)interpreted as an application of the Taoist doctrine of “acting without acting” 为无为. After all, it was the journalist’s question, rather than the spokesman’s answer, that created the media story. “Ours before, still today, more so in the future”: who is claiming the whole South China Sea…and why? China’s official nine-dashed line, as attached to numerous documents submitted to the UN. 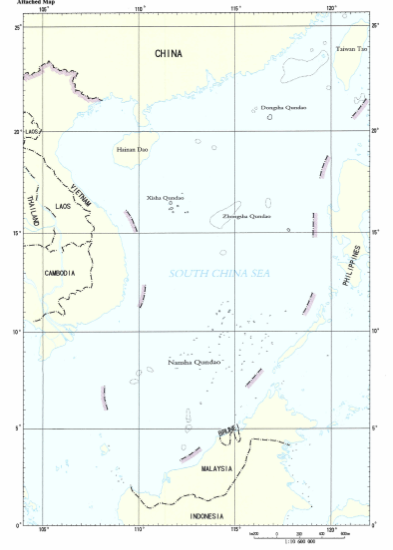 China claims the islands within the 9-dashed line, not the whole maritime area contained within. Foreign Ministry spokesman Hong Lei has attracted some heat from the hot heads of China’s internet population, for daring to state [zh] that “no country, including China, has laid claim to the entire South China Sea”. China uses less public will to press other countries and does not seek to present a hard stance to win people over, despite paying the price of occasional fierce criticism.